Refer a friend for a loan with Gap Equity Loans and earn some extra cash! A quick introduction to a borrower will be rewarded with a $250.00 referral fee for every $50,000.00 USD borrowed. We are not taking on any brokers at this moment, but we are interested in referrals for loan applications! Simply contact us with the potential borrower’s name and phone number and that’s it! This will entitle you to the referral fee, when their loan is finalized. We are a full-time lending organization. Although we are lending about $1 million a month on average, we can use your help! We have more money to lend than great loans coming in. Perhaps you might like to have a small increase in your monthly paycheck. 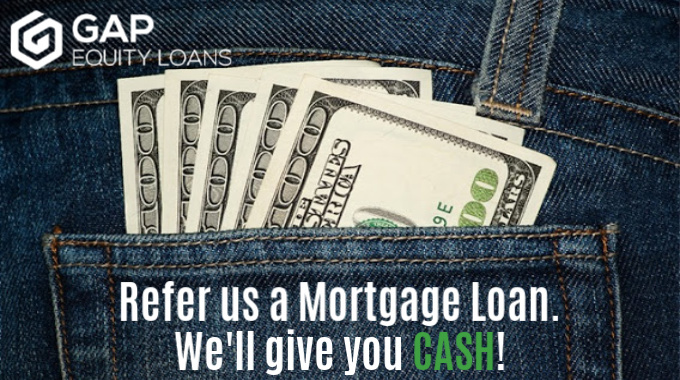 We are looking for great loans and you can pick up a referral fee! What are the basic criteria for a loan? Simple, it must be below 50% of the Loan to Value (LTV). This is based on a “fire sale” price, not a retail price. A fire sale price is a price that the property can be sold in under 90 days. We cannot emphasize strongly enough that the loan amount has to be below 50% of fire sale price! We get so many loans that come in like this: “Value of property=$250,000.00 Amount requested $125,000.00” It’s always magical that the amount needed is exactly half the estimated price of the property. Keep in mind, the higher the Loan to Value, the higher the interest rate. Getting a great loan, realistically, is borrowing $100,000 against a $400,000 property. What is the money for? A very important question. If it is solely to pay off an existing loan, well that’s not too good. If it is to expand your business or renovate your home then that is much better! If you have had a loan in the past and paid it down, this is also good news. By giving potential borrowers these tips, you will expedite the process and this will allow you to receive your referral fees faster! Contact us today for more information about our Refer a Friend program!